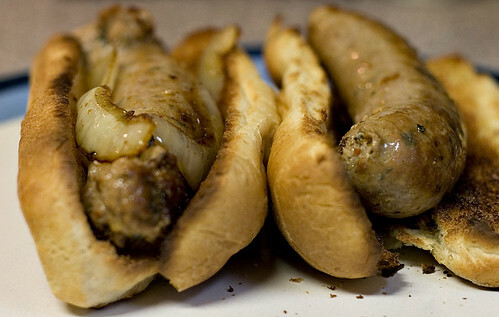 Sausage has a reputation as a pedestrian food. You eat it at a cook out, at a baseball game, or while camping. 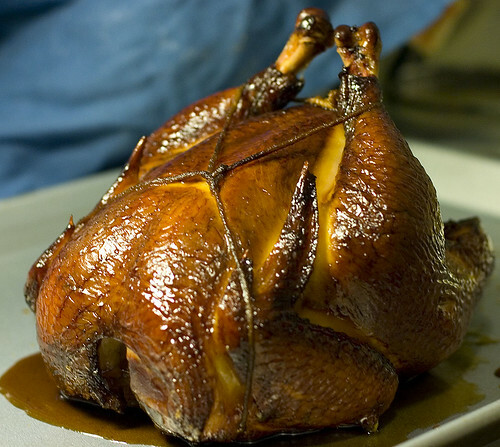 It’s something you eat to satiate your hunger, not because it’s good. But why can’t sausage, in the words of Rodney Dangerfield, get no respect? When it’s good, it should. 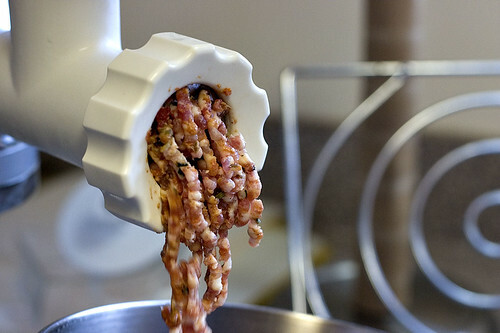 Most are based around pork with enough added fat that it isn’t dry. 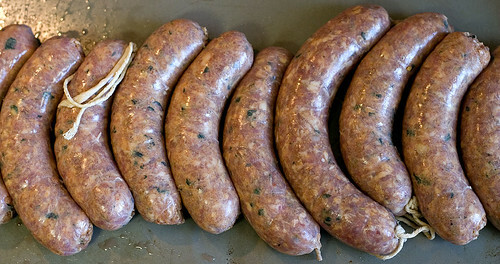 And you can do things with seasonings in a sausage that just wouldn’t work in a whole cut of meat. If you can’t tell, I rather like sausages. But every since I realized that some sausages from the grocery store contained high fructose corn syrup, I’ve decided to stick with the homemade variety. It doesn’t hurt that they taste significantly better. 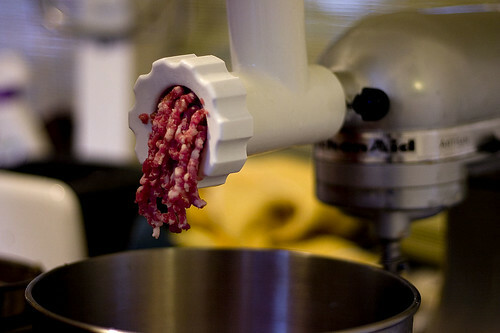 It’s also particularly rewarding to cook up a sausage and realize that you made it. 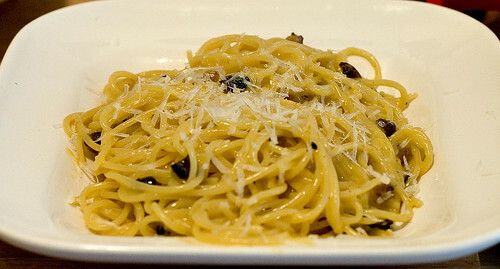 While I tend to like authentic ethnic recipes whenever possible, this is much more Italian-American than Italian. I’m going to let it slide as it’s pretty tasty. When I make it again, I’d probably use less (or possibly no) coriander seeds. It dominates the flavor a bit too much for my taste. It’s particularly good when sautéed and served with good Dijon mustard and grilled onions. 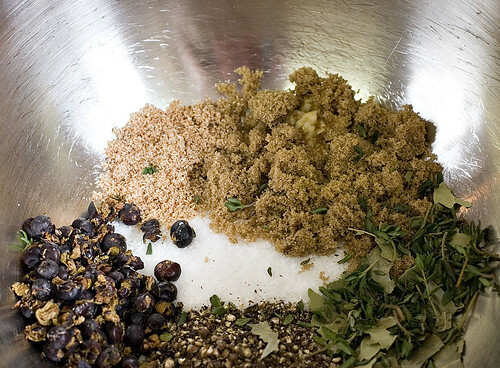 Combine all ingredients except water, vinegar, and casings in a large bowl. Toss to distribute the seasonings evenly. Cover and refrigerate overnight. Add the water and vinegar to the mixture. Beat the mixture with the paddle attachment on medium speed for 1 minute. Mix until the mixture is uniform. Refrigerate the bowl until ready to stuff. 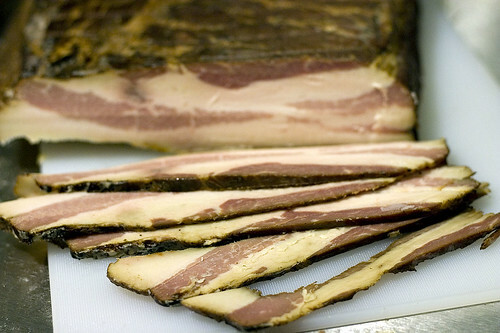 One of my best memories of pancetta is it in a very American context. I had been through a 4 week study abroad in Italy and was then traveling around Europe. My mom had joined me for a week and we were in Riomaggiore in Le Cinque Terre. Staying in a small apartment, we decided to make breakfast for ourselves to save money. The best breakfast I can remember was simply fried eggs with pancetta cooked in a manner similar to bacon. And it’s not that the product was particularly good (it was), but it was simply such a comforting change from the Italian food I’d been eating for months. I actually tried to recreate that breakfast back at home but the pancetta I got was too salty and was practically inedible. The main problem with pancetta here is just how expensive it is. It’s really hard to justify paying the equivalent of $16 a pound for pork belly (or more!). Trader Joe’s sells it for a fairly reasonable price but, anymore, they only sell the pre-diced version which isn’t bad, it just doesn’t do well for things that requiring stuffing (such as braciale). 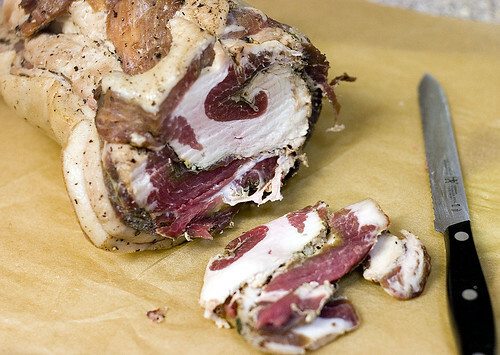 Ever since I bought the cookbook Charcuterie, I had wanted to make pancetta. It’s probably the inner engineer in me, but there’s something particularly exciting about the chemical changes necessary to cure meat. That, and it tastes good (after all, it’s pretty much bacon). I was particularly proud of making the pancetta. It’s not that it took a lot of work (it just took awhile to cure and then dry). 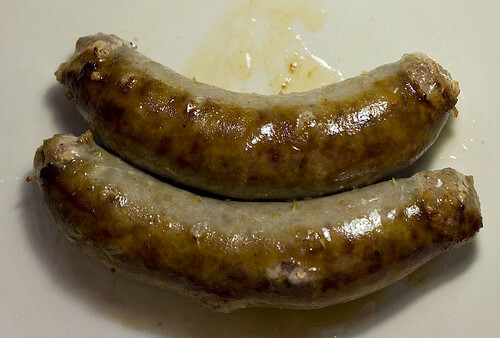 Similar to the bratwurst, it was the act of making something that was far different than I’d ever made before (I act like I was personally changing the chemical bonds to cure the meat). The recipe is pretty easy as long as you have the proper materials. Measuring by weight is important as otherwise you run the risk of changing the ratio of kosher salt to pink salt. Pink salt is not the pink Himalayan salt but is instead salt with 6.25% sodium nitrate. It’s colored pink so that you don’t mistake it for regular salt (sodium nitrate is toxic in large quantities but the sodium nitrate will chance composition as the meat cures so there’s no risk). The drying step is optional but makes for a more authentic product. I used a small refrigerator that I had left over from college for the curing and drying portions as it had plenty of room and my normal refrigerator is pretty full (I also use it to cool down chicken stock and to brine a Thanksgiving turkey). As for the flavor? It was good. Really good. It was almost so flavorful that it was too flavorful to eat. 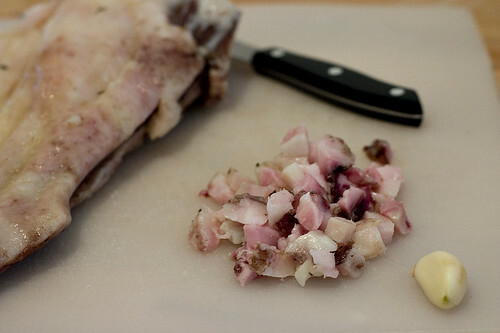 I can’t wait to try it in Pasta with Corn, Pancetta, and Sage or Spaghetti alla Carbonara (of course if I could find some pork jowl I’d try and make guanciale). 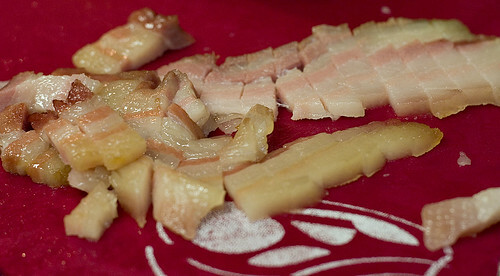 Trim the pork belly to be rectangular and remove the skin if present. Combine all the ingredients except the pork belly and half of the black pepper in a bowl. 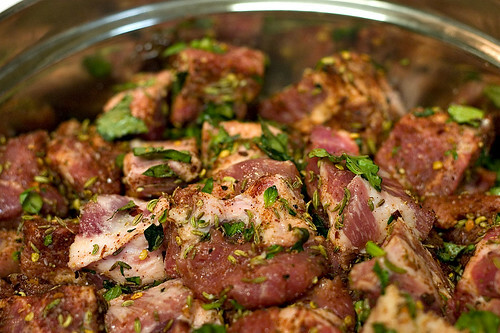 Rub the mixture onto all sides of the pork belly. 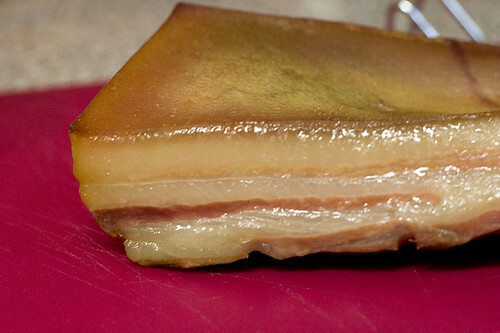 Place the pork belly in a large 2-gallon zip top bag and refrigerate for one week, turning over every other day. When the pork belly is done curing, it will be firm in the middle. If it’s not firm, refrigerate for one to two more days. 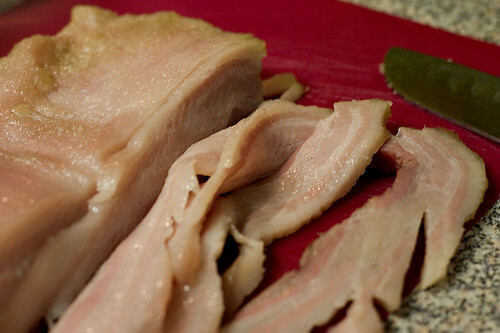 Remove the pork belly from the zip top bag and rinse under running water thoroughly. Dry completely with paper towels. 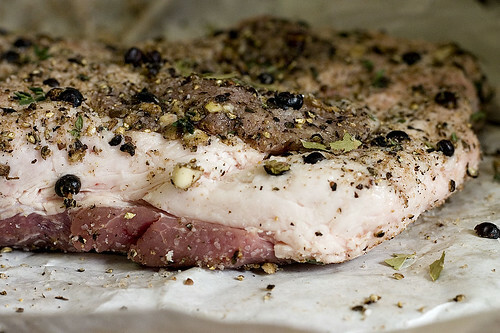 Spread the remaining black pepper over the meat side of the pork belly. 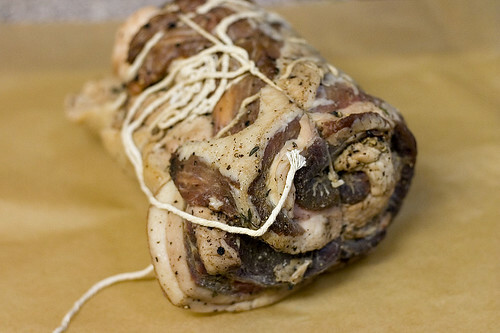 Roll the pork belly tightly (there should be no air pockets) and secure with butcher’s twine. Make sure to loop both around the circumference of the roll and around the length of the roll. Place the pork belly in a spare refrigerator set to its lowest setting on a middle shelf. Place a tray of water combined with 2 tbsp kosher salt in the bottom. This will allow the pancetta to dry. Leave in the refrigerator for 2 weeks. 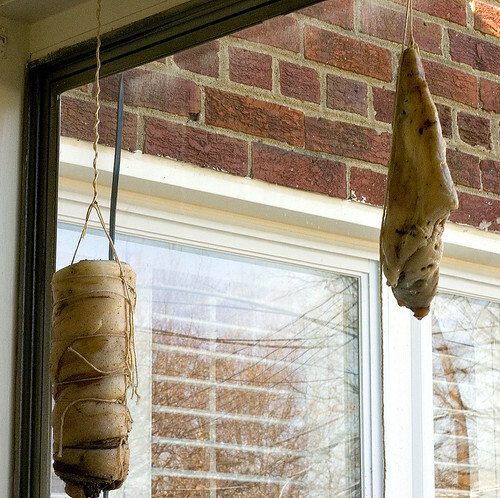 After drying, the pancetta will keep in a refrigerator for 3 weeks and a freezer for 4 months.